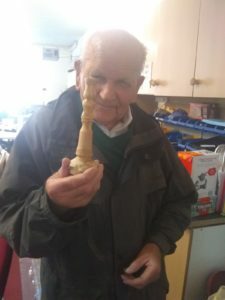 On Monday at Staithes Men’s Shed we welcomed a new Shedder, Tony. He met Graham at the Festival of Thrift in Kirkleatham last weekend. He does leather work (having been a cobbler). He got stuck in with Brian on strengthening a door whilst Martin and Graham worked on electrics with Ted too. 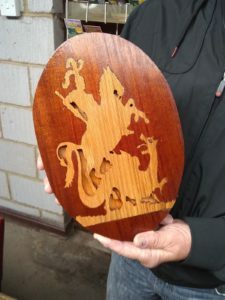 Here is a close up of the fretworked St. George and the Dragon. 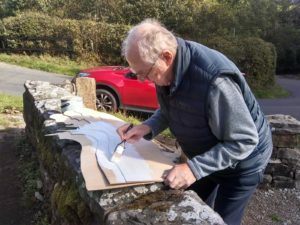 Tuesday at Littlebeck was the day Two Ridings Community Foundation came to film the Shed for the High Sheriff of North Yorkshire’s Dragon’s Den confrontation in October. 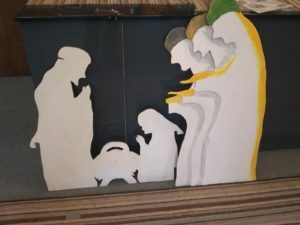 Geoff helped with cutting out and then painting the Three Wise Men commissioned by our friend in Cambridgeshire to add to the nativity scene she had from SAMS last year. Graham did some more work on it on Thursday. The gifts of gold, frankincense and myrrh are to be added! Wednesday at She Shed was attended by Shedder Peter. He had an introduction to the lathe by a very patient Shedder Lance. Peter turned a candlestick..
A proud Peter with the fruit of his labour. 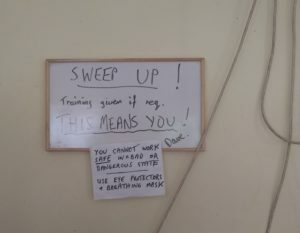 A reminder for Shedders to SWEEP UP. Training is offered under Shedder Eddie. Eddie knows the way up to hold a broom. 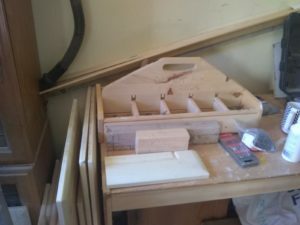 Here is the screw box Dave made a while ago. The other Sheds should do the same!